Kelly in October 2015. Photo by GC Images. Kelly Rutherford, probably best known for playing Manhattan socialite Lily van der Woodsen on Gossip Girl (and yes, okay, the terrible custody fight with her ex-husband Daniel Giersch), has worn ensembles that I think are the height of ladylike elegance, whether she is casual or dressed up to the nines. She seems to favor black, white, and gray, and even in a pair of jeans will add one of her Kellys, ballet flats, and great jewelry to take her outfit to the ladylike level! Kelly is ladylike even in jeans! In a simple trench, with Van Cleef & Arpels earrings, glamorous sunglasses, and a Kelly. I like the simplicity of the look below, and that she paired tones of gray and taupe with white ankle pants. It is probably too warm for it now but I want to try a similar look this fall. She always looks fabulous when it is time to dress up for an evening event too! Kelly at NYFW February 2017. Photo by Theo Wargo/Getty Images. Pink is not a color you normally see Kelly in, but I like this mix on her of pink with fur and metallics that she wore to a fashion show in New York this past February. In black satin in 2011. I believe both of these photos are from February 2011, when Kelly attended the opening night party for the exhibit Set in Style: The Jewelry of Van Cleef & Arpels at the Cooper-Hewitt in Manhattan. Nice Van Cleef gems (on loan I am sure)! I absolutely love the simplicity and light touch of her makeup in the photo below, along with her diamond “Fleurette” earrings by Van Cleef & Arpels. Diamonds go with everything! 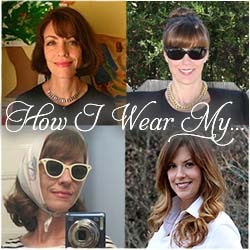 Don’t forget that May’s “How I Wear My” is devoted to Ladylike Elegance! Send your photos to us at howiwearmy@yahoo.com by May 1, 2017 and be sure to include a description of your outfit, which we will use directly in our posts. Oh man I totally loved Gossip Girl!!! She is the real deal!!! IRL! Elegance is not my strong suite, but I'll see if I have anything to bring to the table! I love her style. Thanks for highlighting it! Great looks - so nice to see how everyone styles their elegance differently.